The revolutionary, patented epicyclic design of the Aerobie Epic golf disc gives the disc the largest average rim width to reduce drag and produce amazingly long drives. 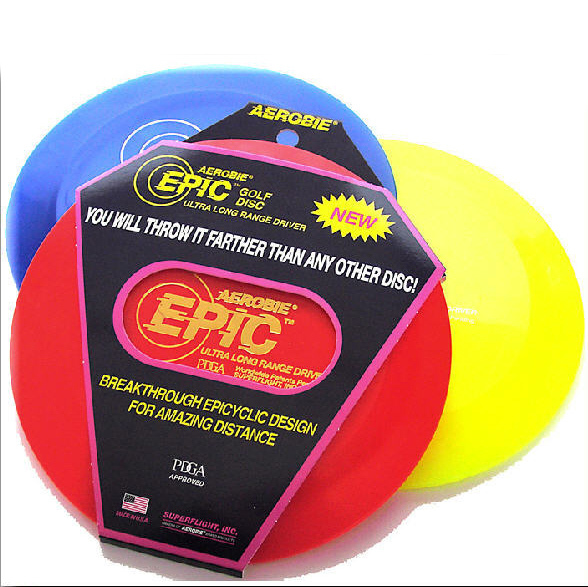 The Epic disc is designed to be adjusted to each individual's throwing style and speed. Properly adjusted or tuned, you will throw it farther than any other disc. We have one word of caution. You will almost certainly not like your first few throws with an Epic driver. Driving the Epic is like driving a Ferrari. It requires skill, concentration, and experience. If you take the time to test throw and adjust or tune the disc to your throwing speed and style, you will learn to capitalize on the Epic’s patented aerodynamic advantages and make the Epic your farthest flying disc. If you quit after a few throws, you may hate the Epic and wonder what all the excitement is about. • Quality made in the U.S.A.